You're looking at the most delicious honey glazed chicken ever. The sweet and sticky sauce is spiced with harissa, a North African paste that is super flavourful. It will be a huge hit with your whole family! I have a confession to make: I've been holding out on you. I don't know what to say except that I am so very sorry. Things got away from me and, well, there really is no good excuse. You guys deserve not to wait for the most delicious recipes, and for making you wait I truly apologize. Really, I do. You see, you should have been eating this honey glazed chicken weeks ago, and I hope you can forgive me for making you wait. I know you live busy lives. You work, have friends, are active and, between all that, you like to find at least a little time to feed yourself (and maybe the awesome peeps around you) well. 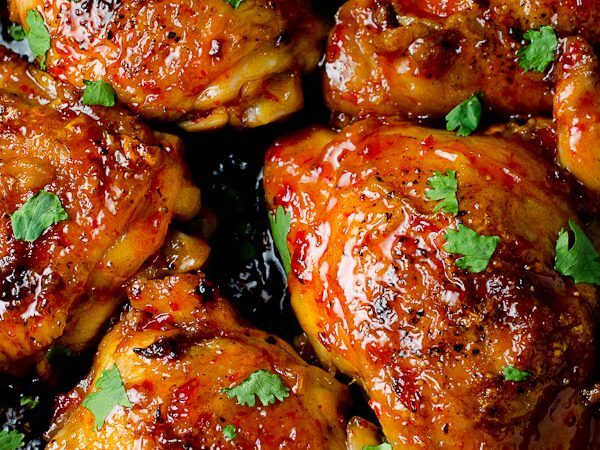 This honey glazed chicken will do that for you: It will let you eat deliciously well in 30 minutes flat. 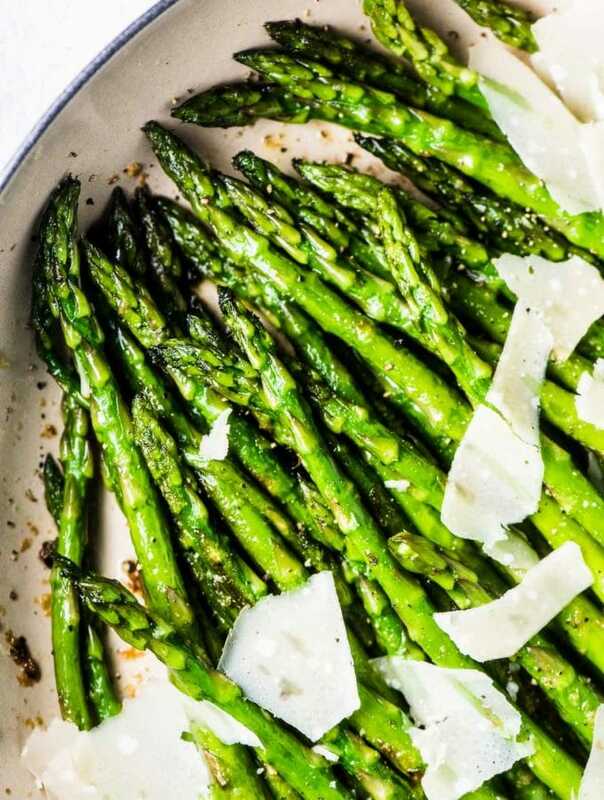 This is one of those fast and easy weeknight meals that you can whip up quickly when you get home and serve with a simple salad on the side for an easy and healthy dinner. I like to make this with the skin on the chicken, 'cause that's just the way I roll. If you'd rather do away with the extra fat from the chicken skin then obviously feel free to leave it off. Yep, you sure can. But … I don't personally think it's as good. I never choose chicken breasts though since I find they don't have as much flavour as thighs and are generally drier. If you prefer breasts though this recipe is definitely customizable, so feel free to use them instead. If you make this Sticky Harissa Honey Glazed Chicken make sure to snap a pic and hashtag #theendlessmeal on Instagram so I can like and comment on it! 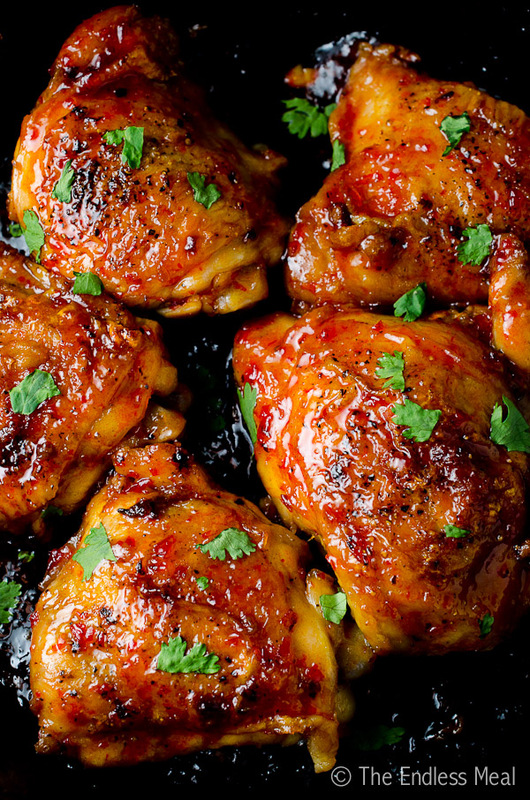 This deliciously sticky honey glazed chicken has just the right amount of heat from a little tasty harissa. You'll be licking the glaze off your fingers! Preheat the oven to 350. 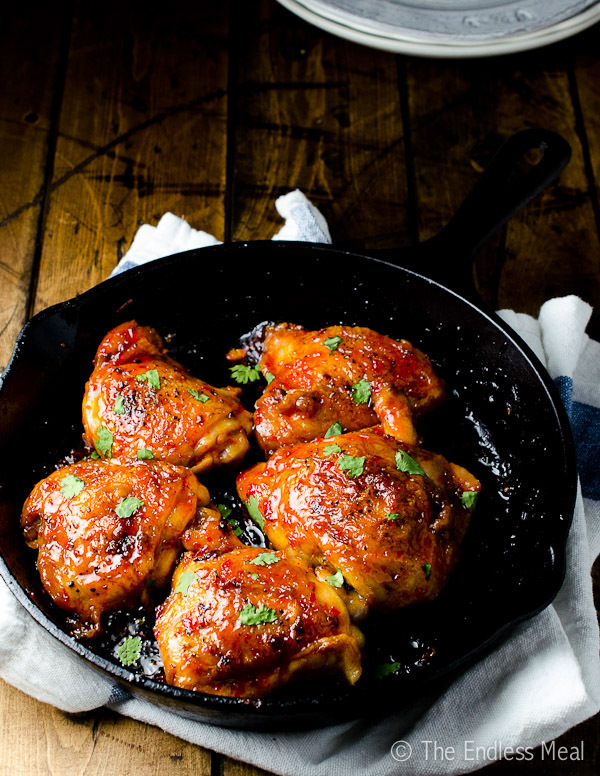 Place the chicken thighs (and the oil if you're using skinless thighs) in a small ovenproof (preferably cast iron) skillet and season it with sea salt and fresh cracked pepper. 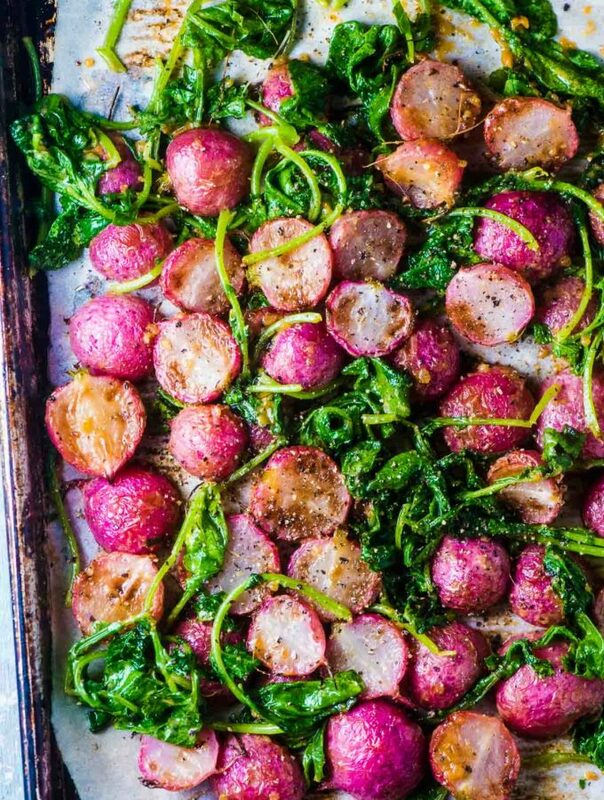 Cover the pan (with a lid or foil) and bake it for 15 minutes. While the chicken is cooking prepare the sauce. Whisk together the honey, harissa, white vinegar and garlic in a small frying pan over medium high heat. Bring it to a boil and continue to boil it, whisking constantly, until the sauce has thickened enough to coat the back of a spoon. Remove the sauce from the heat. After 15 minutes remove the chicken from the oven and drain off and liquid. Increase the oven temp to broil at 450. Place the chicken back in the oven, uncovered, on the second rack from the top. Broil for 10 minutes. Remove the chicken from the oven and drain off any liquid. Pour the honey harissa sauce over the chicken and toss it to coat then put it back in the oven to broil for 5 minutes more. Serve it immediately. Can we use harrissa paste? Hi Kirsten, I tried this recipe as a bb, pre baked for 15 mins since it was an open grill) then on the grill to finish cooking and make the skin crisp. It was so delicious!! I’m so happy you liked it! And great call on grilling them! I cannot wait to try this recipe. It sounds so delicious. Thank you so much for sharing! I love harissa and am always looking for new ways to use it! When you say white vinegar, do you mean white wine vinegar or general white distilled vinegar? I’m making this just tomorrow, can’t wait ? In this recipe, I used white distilled vinegar. If you have white wine vinegar on hand, that would work, too. I hope you like the recipe as much as I do! I know I’m a year or so late… but i’m going to try this out tonight as a stir fry glaze. My harissa is in powder form. Do I need to make it into a paste first?! Hi Abby! I hope I’m not too late in getting back to you. I’ve honestly never worked with powdered harissa before, but since the one I use is a jam-like consistency I would add water to your powder until it is like that. Wow! This turned out so amazing! My boyfriend literally poured the leftover sauce onto his salad as to not waste any and licked his plate clean. This was a huge win! I’ve got leftovers for lunch today and I can’t remember the last time I couldn’t wait to eat leftover lunch Haha Is it noon yet? I love a good sticky chicken dinner! I love the use of harrisa here! Pinnnnned for sure! Just love this North African paste. 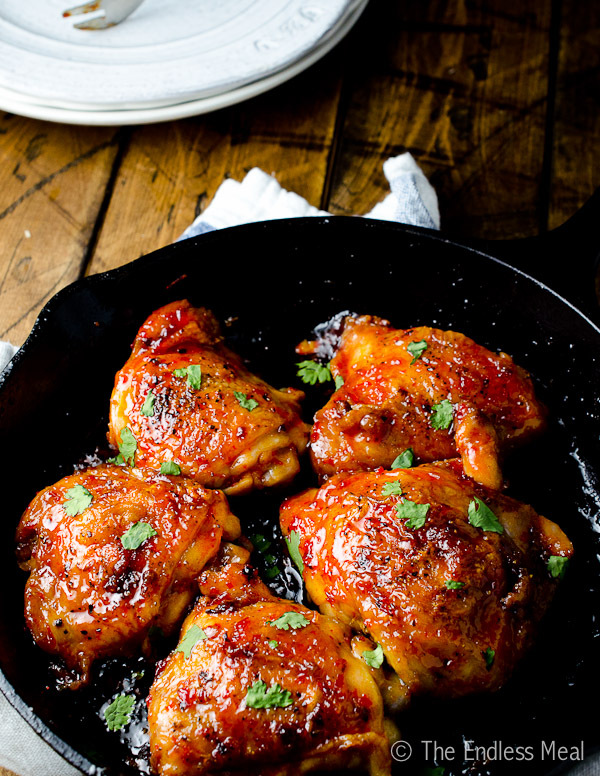 These chicken thighs look succulent, sticky and absolutely delicious. Always have harissa on hand, so I’ll be making these soon! It really is one of my favourites too! You’ve gone and done it again Kristen! Amazing!!! Kristen, this is what I’m saying – your photos are ridonk! You literally kill me. Every time. I want to eat these very badly and will someday fosho! Oh my goodness, this looks so awesome. I’ve got a roast chicken to make tonight and am looking for a new recipe; do you think this one would work? Should I put on the glaze while it’s roasting (since it’ll be roasting at a lower temp)? 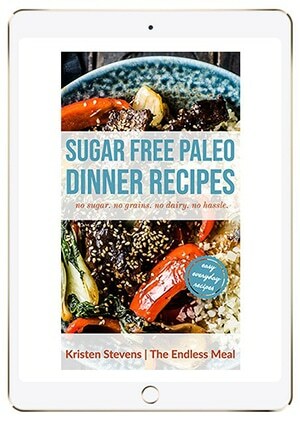 Thanks — and thanks for all the great recipes! I would be afraid that the honey in the glaze would burn if you put it on too soon. My suggestion would be to cook the chicken (with no glaze) at the temp your roast chicken is at and then, when the roast is out of the oven, turn up the temp and add the glaze for the final few minutes. Hope you love the recipe as much as I do!! Whoa – look at the glaze on that chicken. I can almost taste that wonderfully sweet and tangy chicken – I would totally make a mess. Dropping by from YG to thank you for your submission – this chicken looks terrific! This looks amazing. The colours in the photograph are fantastic and I am sure I could eat that whole skillet worth in one sitting. I want this right now. And totally agree with you about the thighs, so much more flavor. Thanks, Allyson! And I’m so happy to hear that other people feel the same about chicken breasts. Thighs all the way! Now this is one incredibly delicious looking dish. I totally am drooling over that sticky, sweet and spicy glaze! It’s good to hear I’m not the only one who feels that way! I usually think I’m alone in the world of those who don’t like chicken breasts lol. These look fabulous. I have always been curious about harissa and this recipe gives me a great reason to finally go buy some to try out. Thanks.